Equality between women and men in the democratic Constitution of Japan. I was convinced of the critical importance of Beate’s contribution, knowing how much both articles contributed to laying the foundation after WWII which has led to significant improvement in the quality of life for women in Japan. In addition, I am impressed by the fact that a number of laws were created to ensure equality between women and men. These laws reflect those articles which Beate had originally drafted for the Constitution but which were not included except for only precious few. The film offers a post-war perspective on the history of Japanese women. It refers back to a number of events that show how hard many Japanese women have worked (even fought) to have human rights for women accepted and established in society. Not only are we shown how Beate drafted these important articles, guided by her mysterious destiny, driven by her father Leo Sirota’s (Leo Sirota grew a number of Japanese pianists) and her mother’s love of Japan and, above all, by her unwavering determination to improve the fate of Japanese women, we are also made aware of how these articles influenced the course of world history in the 20th century. Born in Tokyo in 1932, Tomoko FUJIWARA attended the University of Tokyo where she major in Aesthetics. Attracted by the manifold possibilities for expression via film as a medium, she launched her career in a documentary film soon after graduating. FUJIWARA made her debut in 1960 with "The Wisdom of the Orang-utan". In 1979, FUJIWARA, then 47 years old, resumed her activities as a film director. During the 1980s, she made a number of short documentaries about Art, e.g. Noh and Kabuki (Japanese traditional theatre performances). FUJIWARA also received many prestigious awards, such as the Award of the Minister of Education and the Work of Art Award. In 1995 FUJIWARA released her first long documentary film entitled "Fifty Years of Evacuated Children- Messages for Tomorrow". "Choi Seung-Hee and Kim Meija"
the 1st prize in the Kinema Junpo event, offered by one of the most prestigious film journals in Japan. At the 55th edition of the Mainichi Film Event it won the best documentary prize in the Documentary and Cultural Film category as well as a 1st prize in the non-fictional category of the Japanese PEN Club Awards. After "The Gift from Beate" was released, Fujiwara made another documentary related to Beate Sirota Gordon’s family history entitled, "The Sirota Family and the 20th Century" (2007), which got the Special Prize of the Jury at the 7th Kiev International Documentary Film Festival. 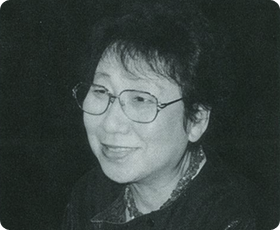 Fujiwara recently authored a scenario entitled "A Cry from a Century Ago"
1995, "Fifty Years of Evacuated Children - Messages for Tomorrow"
1999, "Choi Seung-Hee and Kim Meija"
2000, "The Life of Umeko Tsuda – A dream Across Time and Place"
2004, "The Gift from Beate"